Mothers of Men, a 1917 women’s suffrage film shot on location in Santa Cruz, will be screened at the Del Mar Theater on October 13 as part of the city’s celebration of its 150th anniversary. 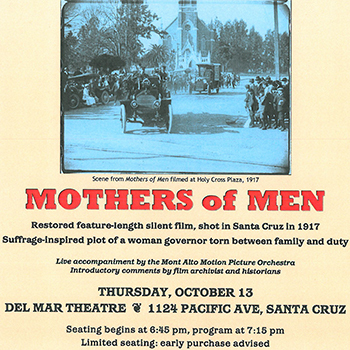 Mothers of Men includes some of the only surviving moving images of historic Santa Cruz. The restored feature-length silent film contains stunning footage of the city 100 years ago, featuring downtown streets, landmarks like Holy Cross Church and Piedmont House, as well as iconic structures that no longer exist, such as the Cooper House (destroyed in the Loma Prieta earthquake) and one of the rock arches from Natural Bridges State Park. The film was once assumed to be lost. But it was recently restored under the supervision of Santa Cruz native James Mockoski, a graduate of UC Santa Cruz’s Film & Digital Media Department, who is also the longtime archivist for Francis Ford Coppola’s American Zoetrope studio in San Francisco. Mockoski came across a print of the film in 1997 while working on his senior thesis project on film history in Santa Cruz County with UC Santa Cruz film and digital media professor Shelley Stamp. Now, nearly two decades later, his dream of restoring the film has finally come true. “James found a print of the film, long assumed to be lost, while researching his senior thesis project 20 years ago. That, in itself, is amazing! 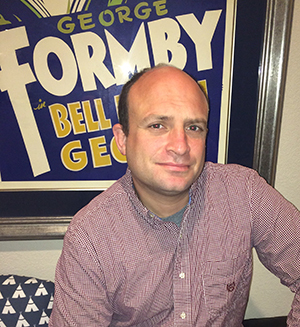 After he became a professional film archivist, he never lost sight of his original dream to restore the film. His is an example of the extraordinary work our students do here, and the impact this work can have on the world at large,” she added. The restored film print had its premiere at the San Francisco Silent Film Festival in June and was recently broadcast on Turner Classic Movies as part of its Trailblazing Women series. As part of the restoration, Mockoski commissioned a new score from the Mont Alto Motion Picture Orchestra, a five-piece chamber group noted for their silent movie scores. The ensemble will provide live accompaniment during the film’s screening in Santa Cruz. Stamp noted that Mothers of Men is a particularly interesting example of the kinds of films made about women’s suffrage in the years leading up to the passage of the 19th Amendment in 1920. “Of course, all kinds of problems ensue where the heroine's personal life becomes entangled in her professional responsibilities,” Stamp added. “But the film raises questions that are still circulating in today’s presidential election: Can women provide effective political leadership without their heartstrings getting in the way? Do women bring a stronger moral compass to public office? How does the popular press treat women in elected office?" The film screening at the Del Mar Theater will include introductory remarks by Stamp and the film archivist. Doors open at 6:45 p.m. and the program begins at 7:15 p.m. The event is presented by the City of Santa Cruz with sponsorship from Landmark Theatres, UC Santa Cruz, the Museum of Art & History and the Community Foundation of Santa Cruz. It is co-sponsored by the League of Women Voters, the Santa Cruz Film Festival and the Downtown Association. Tickets are available at: https://www.landmarktheatres.com/santa-cruz/del-mar-theatre/private-screenings.